A blend of chocolate and raspberry flavor rolled up to make a yummy cookie. Everyone will love the combination of chocolate and raspberry flavor. These marbled cookies are not only delicious but they make a nice addition to your platter of holiday treats. 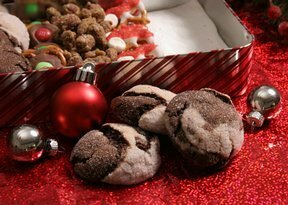 Step-by-step instructions for everything from making the cookie dough to storing your decorated cookies. See how fun it can be to make these decorated gingerbread men. Get the kids involved in making their own little people.